Ever since the Rev Turp pointed out to me the spot outside Shoreditch Church where the river Walbrook had its wellspring, I have been curious to discover what happened to this lost river which once flowed from here through the City to the Thames. This photograph of the Walbrook, which was taken by Steve Duncan, the urban explorer, deep beneath the Bank of England in 2007, gives the answer. The river has been endlessly covered over and piped off, until today it is entirely co-opted into the system of sewers and drains. Yet in spite of this, the water keeps flowing. Irrespective of our best efforts to contain and redirect water courses, the movement of water underground always eludes control. 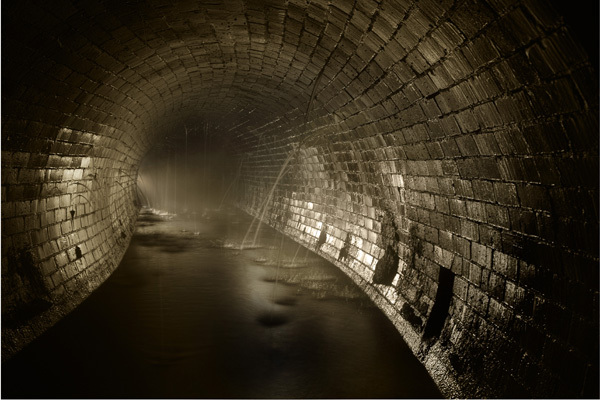 A fascinating detail of this photo, which shows the sewer deep below the City, built in the eighteen forties, is that today the water table in the City has risen to the level where water is actually pouring from the surrounding earth into the tunnel between the bricks.With astonishing courage, Steve Duncan enters these secret tunnels through manhole covers and undertakes covert explorations, bringing back photos of the unseen world that he finds down there, as trophies. I was captivated by this nightmarish subterranean image, which reminded me that the primordial force of nature that this river manifests still demands respect. Lacking Steve’s daredevil nature and experience in potholing, I decided to keep my exploration above ground, following the path of the river and seeing what sights there are to be discovered upon the former banks of this erstwhile tributary of the Thames. The Walbrook has attracted its share of followers over the years, from anti-capitalist protestors who attempted to liberate the river by opening hydrants along its route, to milder gestures adopted by conceptual artists, sacrificing coins to the river through storm drains and releasing fleets of paper boats into the sewers. 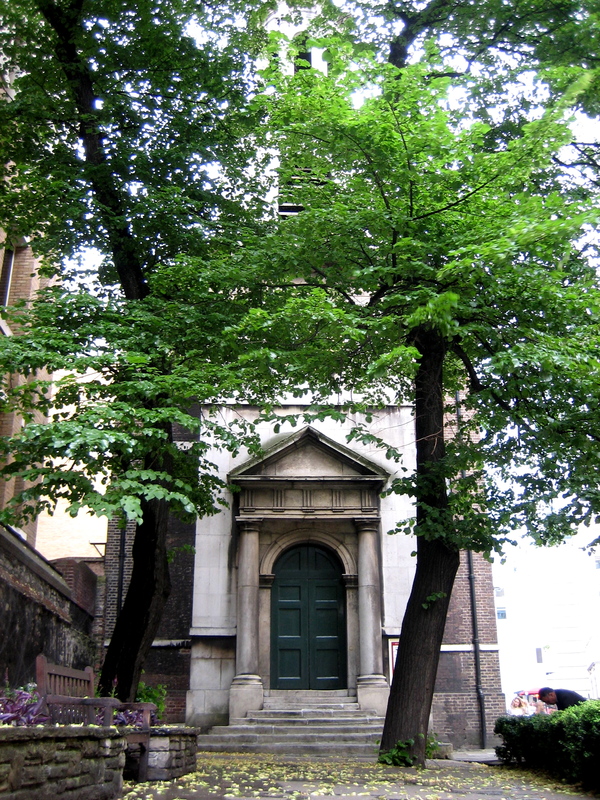 Arriving at St Leonard’s Shoreditch, as the first drops of water from the ominous lowering clouds overhead began to fall, the Rev Turp’s description of the poisoning of the Walbrook (when seepage from the seventy-six thousand human remains in the churchyard found its way into the watercourse) came to mind. The Walbrook, which entered through the wall beside the church of All Hallows on the Wall, was the only watercourse to flow through the City and was both an important source of freshwater as well as a conduit to remove sewage, two entirely irreconcilable functions. There is no evidence of the route of the brook outwith the wall and so I walked straight down Curtain Rd, entering the City at London Wall, with the church of All Hallows on the Wall to my left. I turned right on London Wall, where the brook was once channeled along the wall itself. At Copthall Avenue, I turned left where the watercourse flowed South down through Token House Yard, under St Margaret’s Church and the Bank of England. 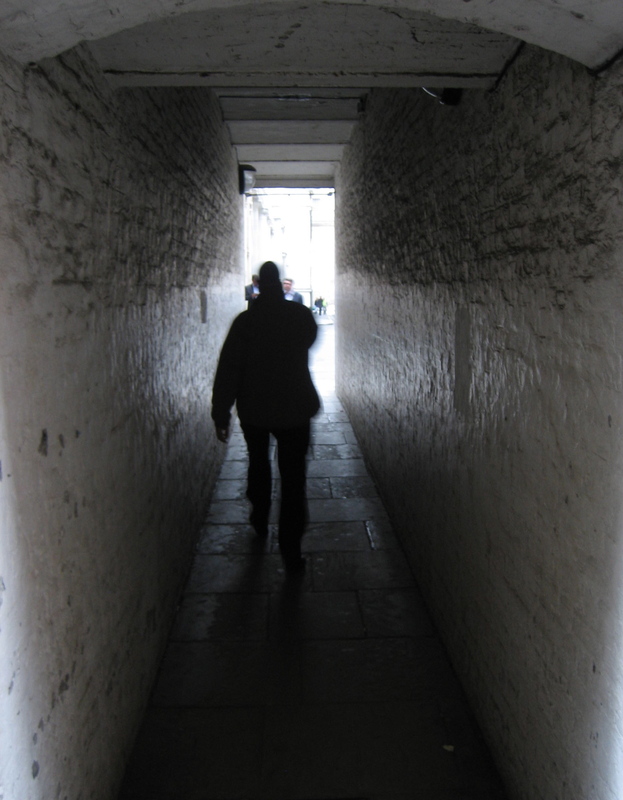 As I left Copthall Avenue to walk through the maze of narrow lanes, including Telegraph Alley and Whalebone Alley, the changing scale indicated I was entering the ancient city. 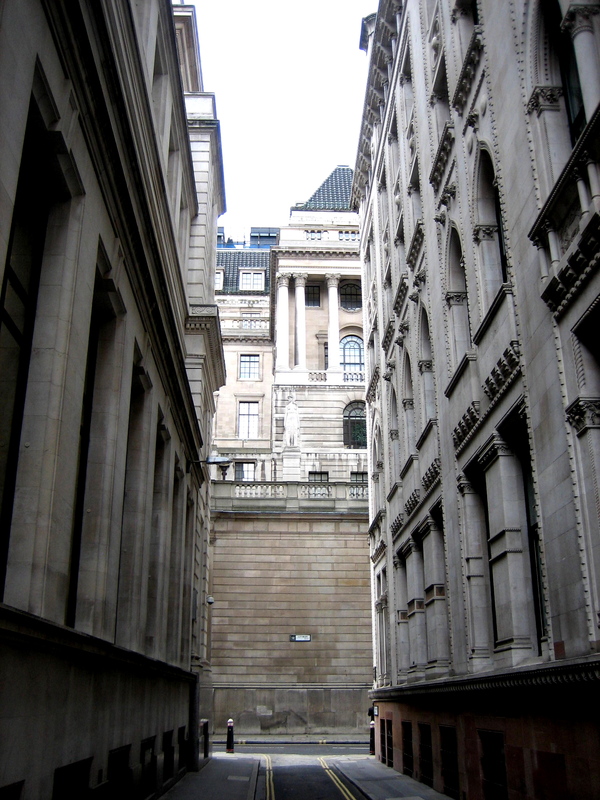 Then I enjoyed a breathtaking moment as I passed through the dark low passage into Token House Yard, discovering a long tall street with cliffs of grey buildings on either side, that ended in the towering edifice of the Bank of England. From here, I walked down Princes St to emerge at the front of the Bank facing the Mansion House, basking for a moment in the drama of this crossroads, before walking onwards down Poultry past Grocer’s Hall and then turning left to arrive at the Temple of Mithras. Just an outline in stone today, the former temple which was discovered in 1954 on the bank of the Walbrook, eighteen feet below modern ground level, and moved to this location. Desolate and disregarded now, collecting litter beneath the condemned blocks of Temple House, it is a miraculous survival of two millennia, standing at the head of the navigable river where barges were berthed in Roman times . At the time of these excavations, a square token of lead with the name Martia Martina carved backwards on it was found, once thrown into the Walbrook – in Celtic culture this was believed to bring bad luck to the subject. Also, in the eighteen sixties, Augustus Pitt Rivers uncovered a large number of human skulls in the river bed, which could be either those of a Roman legion who surrendered to the Britons or the remnants of Boudica’s rebellion. Both these finds may reflect a spiritual significance for the watercourse. Next stop for me was Christopher Wren’s church of St Stephen Walbrook on the far bank of the Walbrook. My favourite of his City churches, this is always a place to savour a moment of contemplation, beneath the changing light of the dome that appears to float, high up above the roof. 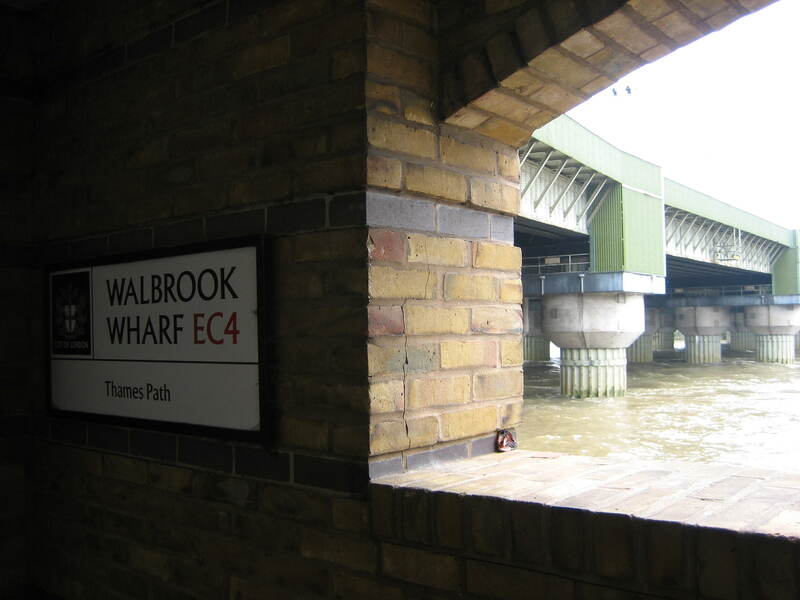 The name of this street, Walbrook, within the ward of Walbrook confirms beyond doubt that you are in the vicinity of the lost river, and from here it is a short walk down Cloak Lane by way of College Hill to Walbrook Wharf on the riverfront below Cannon St Station, where the Walbrook meets the river Thames. In the end, whatever route they came by, this is where the raindrops that fell outside Shoreditch Church arrived eventually. I am entranced by the romance of the lost river Walbrook – even if it may have been a stinking culvert rather than the willow-lined brook of my imagination – because when you are surrounded by the flashy overbearing towers of the City, there remains a certain frail consolation in the knowledge that ancient rivers still flow underground beneath your feet. All Hallows on the Wall, where the Walbrook entered the City of London. The passage from Whalebone Alley to Token House Yard. Approaching the Bank of England. 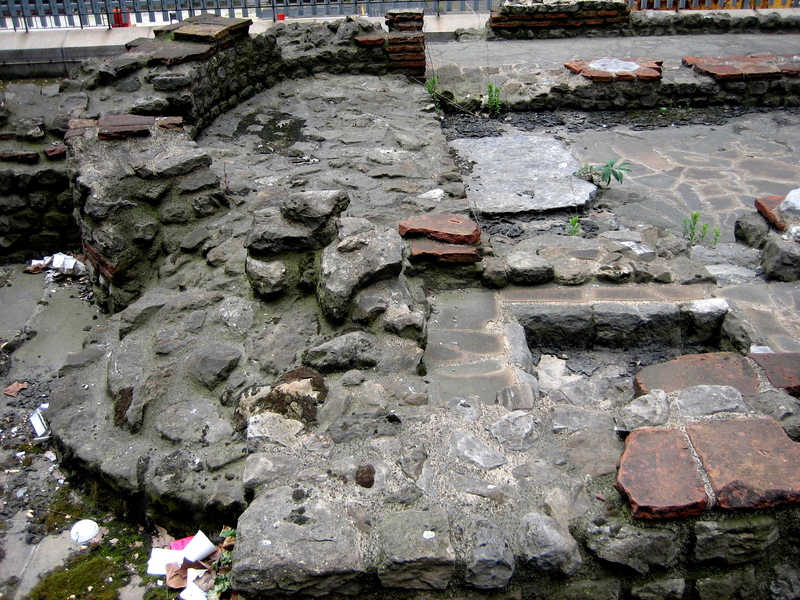 The Roman temple of Mithras stood on the bank of the Walbrook. 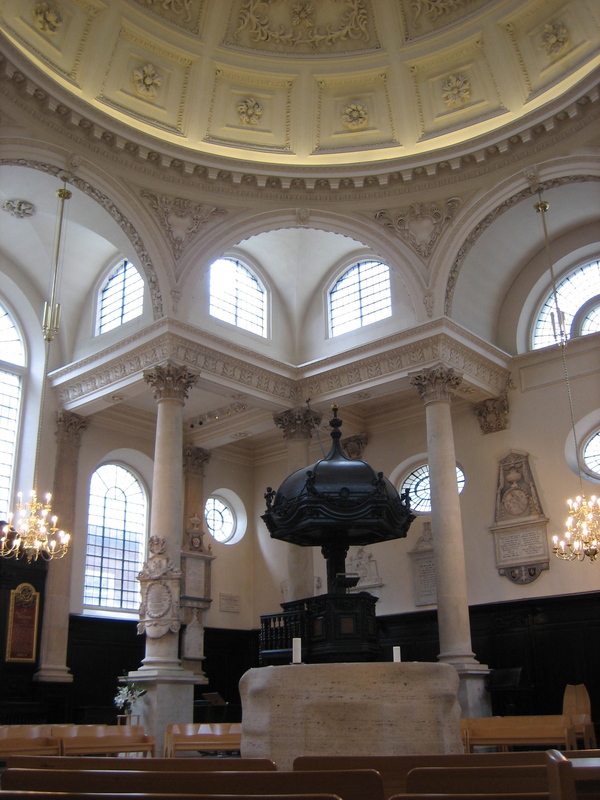 Christopher Wren’s church of St Stephen Walbrook with altar by Henry Moore. 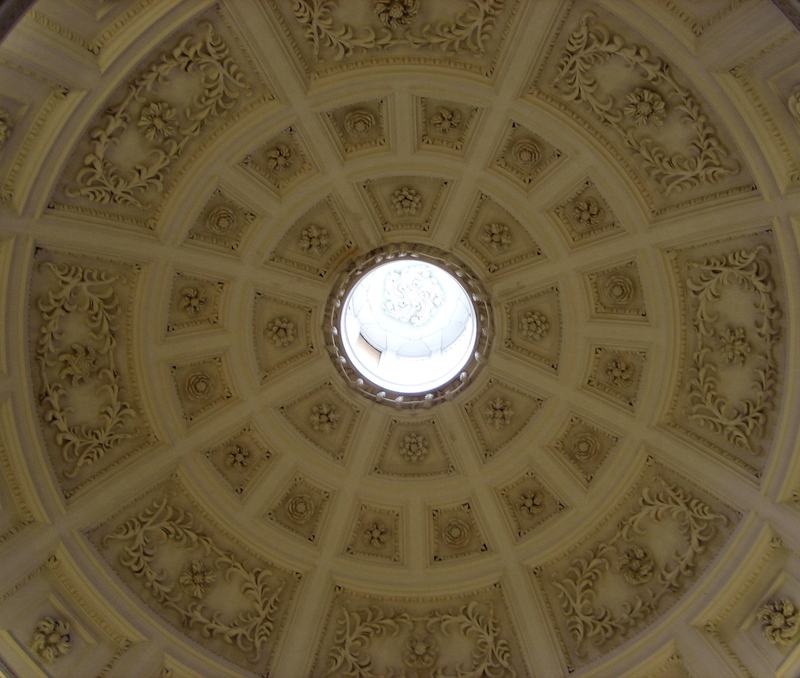 The dome of St Stephen Walbrook. Interesting piece about the Walbrook. I can provide you with some social history from the Medieval period. The Welsh cattle drovers established a settlement on the banks of the stream in the early 1300′s which they called Llundain,having travelled from North Wales on Watling Street.They established hundreds of these settlements in Southern England. “Tenement of Robert Cok with houses and gardens in the parish of All Hallows (atte wall) called Little London situate near a tenement belonging to the work of London Bridge , extending from the highway near London Wall north as far as the ditch of Walbrok south”. Hoping you may find this interesting. I understood that the name “Walbrook” is of ancient Anglo-Saxon origin and dates to the earliest period of their settlement. Some time around 550AD when sub-Roman Londinium yielded to the might of the East Saxons (whom it would seem had placed the city under siege) the Romano-British inhabitants with their valued trading contacts with France, Spain and elsewhere were permitted to remain but were compelled to live on the east side of the stream which ran through the middle of the old city. This stream became the dividing line between the Welsh and the Saxons and hence got the name Wal-brook (“Wal” being a derivation of “Wealh” and the etymological root of the words Wales, Cornwall, Wallonia and Wallachia, it being a Germanic word used to describe any inhabitant of the former Roman Empire who did not speak Latin). For trade to flourish the Saxons had to respect the Romano-Britons (Welshmen) who remained in “Lundonburg”…and from this origin, so it goes, the paramount authority of the Lord Mayor of London is derived – represented today by the way the English sovereign must touch the Lord Mayor’s sword and thus acknowledge this authority before entering the City. It is further symbolised by the dragons which guard the city limits. Going back even further in time to around 100BC this little stream ran between the two hills upon which London was originally founded, legend has it, by a king named ‘Llud map Beli’. Legend has it that there had been two rival communities on Cornhill and Ludgate Hill who would fight each other around the fording of the Walbrook which lay between them. Llud (after whom Ludgate is named) united the two communities and this place, with a presumed spiritual significance to the ancient Britons, was occupied by the Romans under Claudius c.34AD. Fantastica orografia,ci fa capire i luoghi in cui viviamo e la loro storia: quello che si poteva coltivare ,dove,come,quanto. quel che si poteva costruire in un determinato luogo,e quel che no…e così via..
Traduzione : Sorry for my approximative english. Temple of Mithras,has now moved too its original site,now based in the Bloomberg Under ground display at their new building in the city,open to the public,appointments only,but free of charge,worth a visit,they even supply head phone,I pads, and guides. My friends and I where among the first people to see it when they uncovered it back in the 50s, made headlines in the Daily Mail.